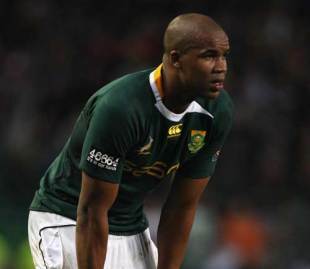 South Africa will complete their Tri-Nations campaign without winger JP Pietersen and lock Andries Bekker after both were force to fly home with injuries picked up in Saturday's victory over Australia in Perth. Pietersen tore his hamstring during the 32-25 triumph, while replacement lock Bekker suffered a shoulder injury. With the Springboks set to face the Wallabies in Brisbane on Saturday, coach Peter De Villiers has elected not to replace the duo in his squad. Sharks wing Odwa Ndungane is the logical cover for his domestic team-mate Pietersen, while Danie Rossouw has recovered from the hamstring problem that ruled him out of contention for Saturday's game and will likely slot straight on to the bench. "We will look to within the squad for cover," De Villiers told The Star. "I am not big on bulky squads and we have more than enough talent to cover for these injuries." Lock Bakkies Botha and wing Bryan Habana also sat out training on Monday, with abdominal and groin injuries respectively, but it is not yet clear whether they will miss the game. "The Bakkies injury is more of a worry than anything else, especially since Danie is fit but hasn't played for a while," said De Villiers. "We haven't used him a lot and we'll have to see whether he can be an 80-minute player. "Bryan is more precautionary, he was rucked in the groin, but he could have played today if he had to. But it's a tough tour and the management of the players is important." The Wallabies also have injury concerns ahead of the weekend, but are hopeful that both centre Berrick Barnes and lock Nathan Sharpe will be fit to return. Quade Cooper, who laid on a try for fly-half Matt Giteau in a lively second-half cameo, has a knee problem that may affect his involvement.